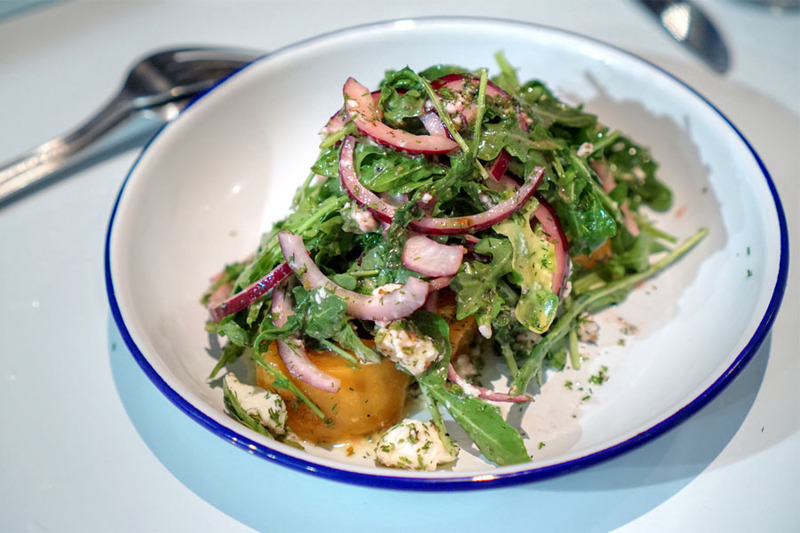 One of the newest restaurant debuts in Santa Monica is Inotheke, a modern Greek eatery with a wine focus that opened at the end of November. It's the work of Carolos Tomazos, whom we know for his front-of-the-house roles, most prominently here at Waterloo & City. However, for this latest project, he's in charge of the menu too, giving us updated versions of the types of dishes he grew up with. 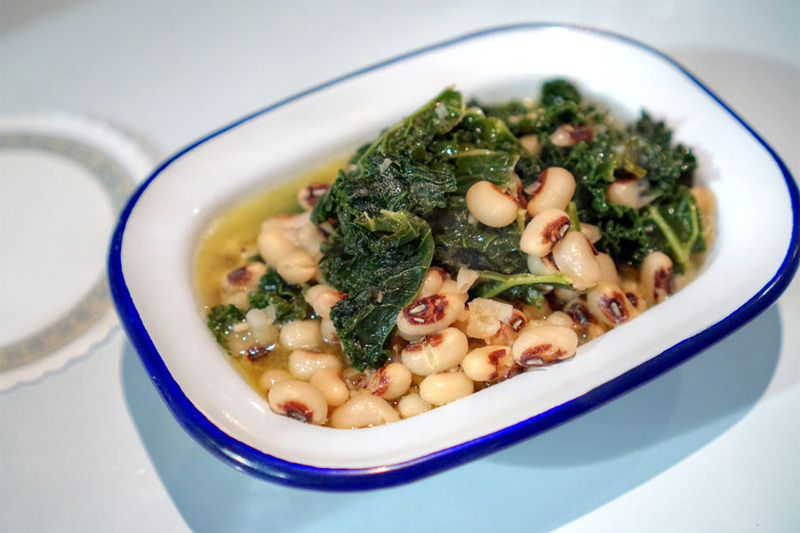 About the Chef/Owner: Tomazos was born and raised in Cyprus. His mother was a chef and encouraged him to pursue a role in hospitality, and he thus started out in the FOH at resort properties on the island. He eventually moved to Vienna to attend MODUL, and during his stint there, worked at luxury hotels in the City. After graduating, Tomazos went to Mykonos and helped open boutique hotel Cavo Tagoo, then took on a number of cruise liner positions at Hanseatic and Cunard. Tomazos wound up settling in New York, and in 2000, found a job at Alain Ducasse, where he stayed three years and also met his wife. 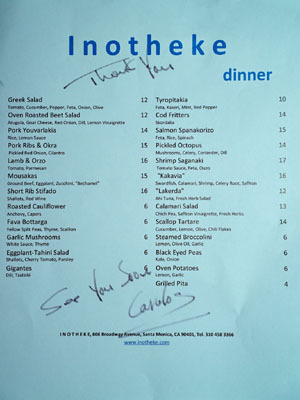 In 2003, he began working for Thomas Keller at The French Laundry, and subsequently opened Per Se in 2004. He left, however, just a year later to become Restaurant Director at Gilt at the New York Palace; this was followed by a short period at Le Bernardin. In 2008, Tomazos and his wife relocated to Los Angeles, and he soon became GM at the Palihouse, where he met Chef Brendan Collins. Along with Thierry Perez (Chez Soi, L'Épicerie, Riva, Fraiche), they began conceptualizing Waterloo & City, with the game-changing gastropub eventually debuting in May 2010 (note that Perez had left the partnership earlier that year). 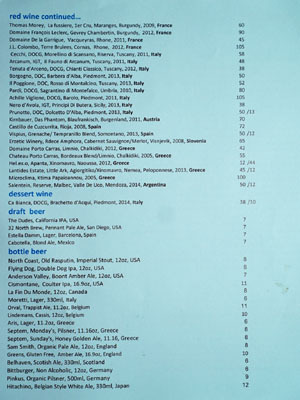 In August 2011, Tomazos and Collins followed up W&C with Larry's in Venice, set in Erwin and Mark Sokol's Hotel Erwin. 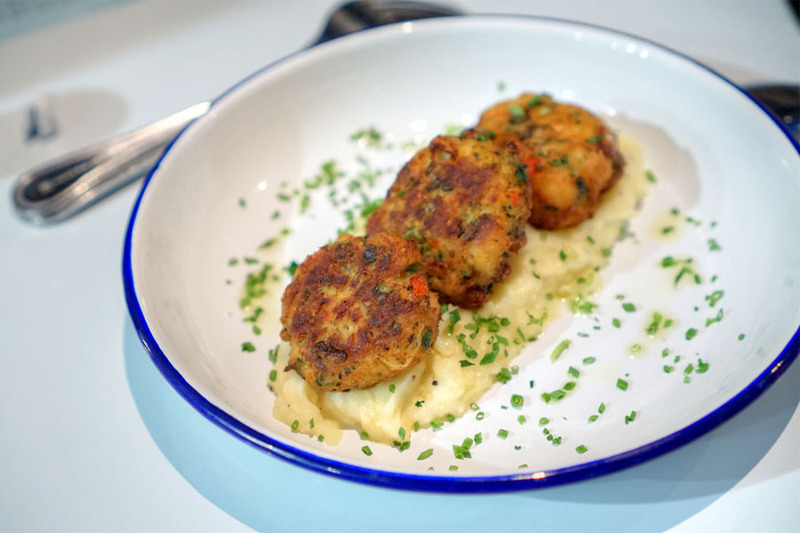 The pair is still involved with that restaurant, though Waterloo was sold in late 2014 and is now home to Brian Dunsmoor and Jonathan Strader's well-regarded, Southern-inspired Hatchet Hall. Inotheke resides in the former home of Ciboteca, which has been redone to a light, airy sort of aesthetic. 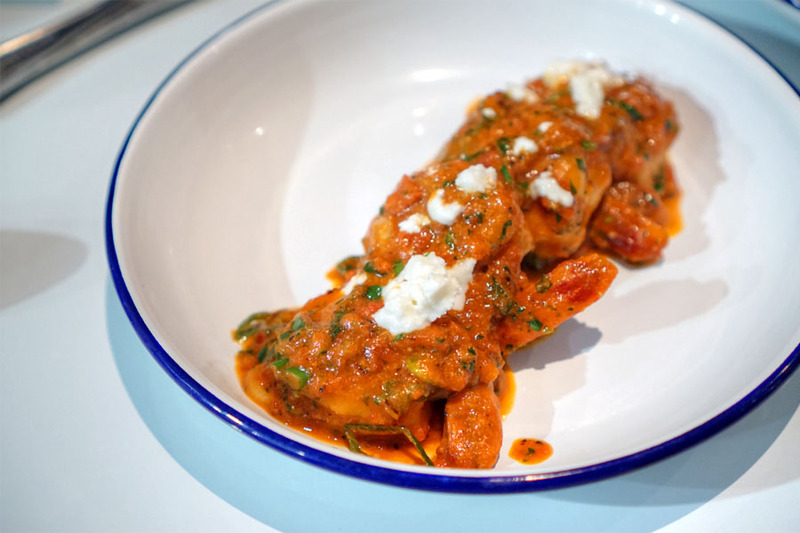 As for the menu, you get contemporary Greek-slash-Mediterranean dishes presented in shareable small plate format. 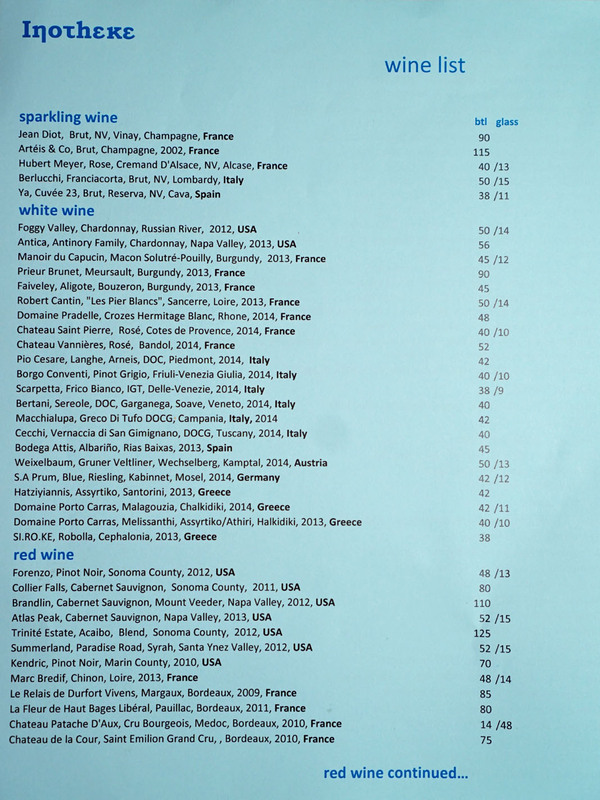 To imbibe, there's a surprisingly lengthy wine list and a selection of beers that's probably better than you'd expect. Click for larger versions. 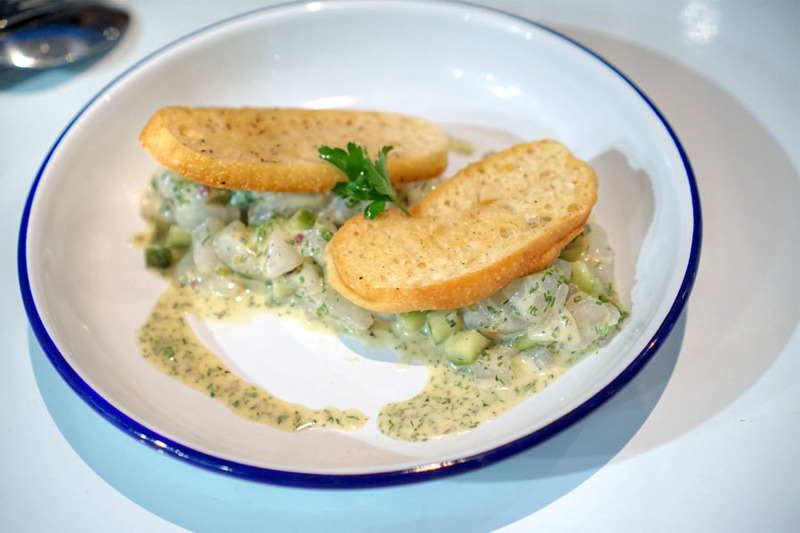 We began a long parade of dishes with a seemingly prosaic fáva dip (I'm not referring to fava beans). 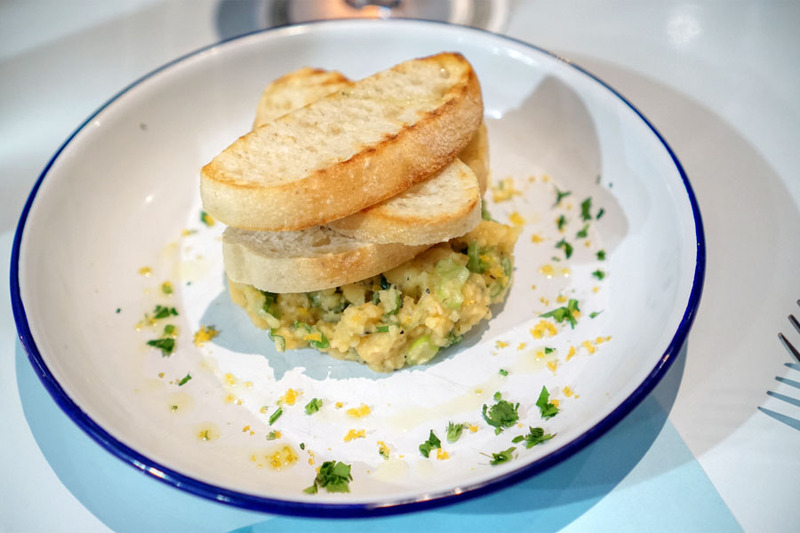 It turned out to be a standout though, with the nuttiness of split peas beautifully enhanced by the depth of the cured roe and the herbiness of thyme and scallion. Excellent over the crispy toast. Octo showed off a lovely suppleness and chew, perked up by loads of peppery spice and the bitterness of the greens while the dish's tangy dressing helping bring it all together. 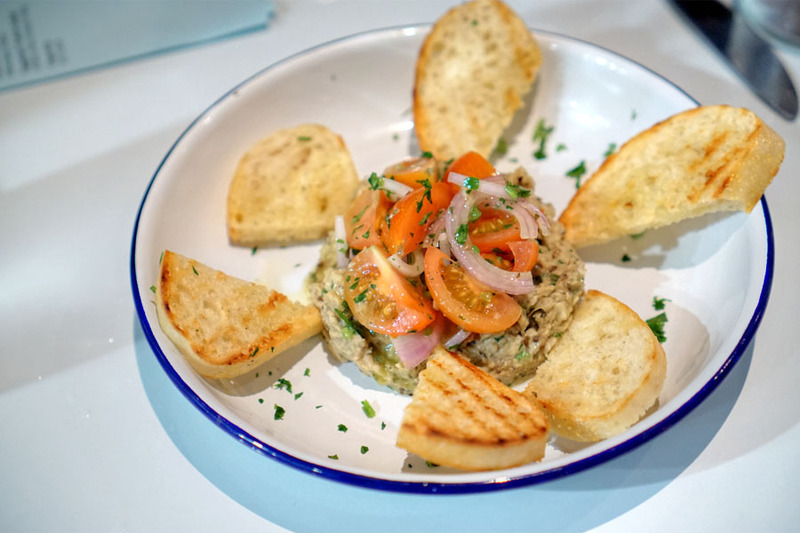 The melitzanosalata was just what I was looking for, with the smokiness of the eggplant well-conveyed and set against zesty shallot and juicy tomato while parsley gave an overarching herbiness to things. A beet salad was about as good as I could expect, the beets' earthy sweetness balanced out by the richness of chèvre, with the pickle-y onion and bitter arugula adding further contrast. 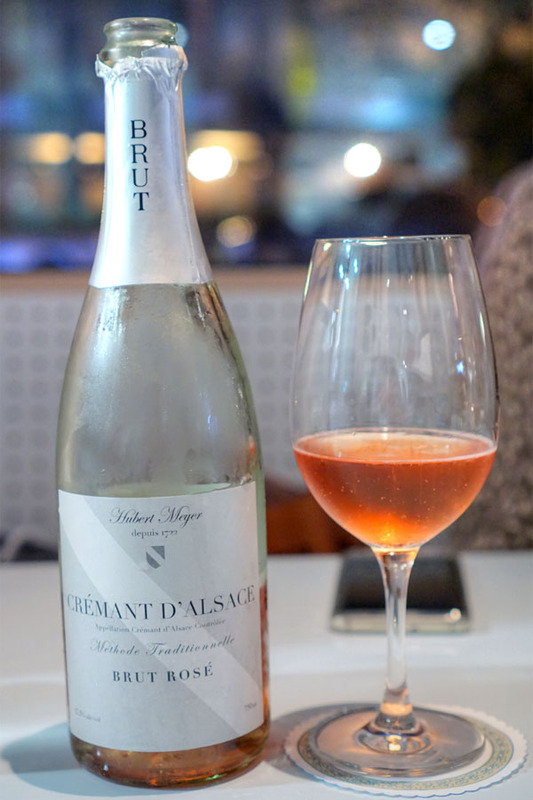 To drink, we began with a bottle of bubbly, the Hubert Meyer, Rose, Cremant D'Alsace, NV, Alsace, France [$40]. It was definitely a quaffer, with lots of fruity strawberry notes abound, offset by a persistent acidity and dryness on the finish. 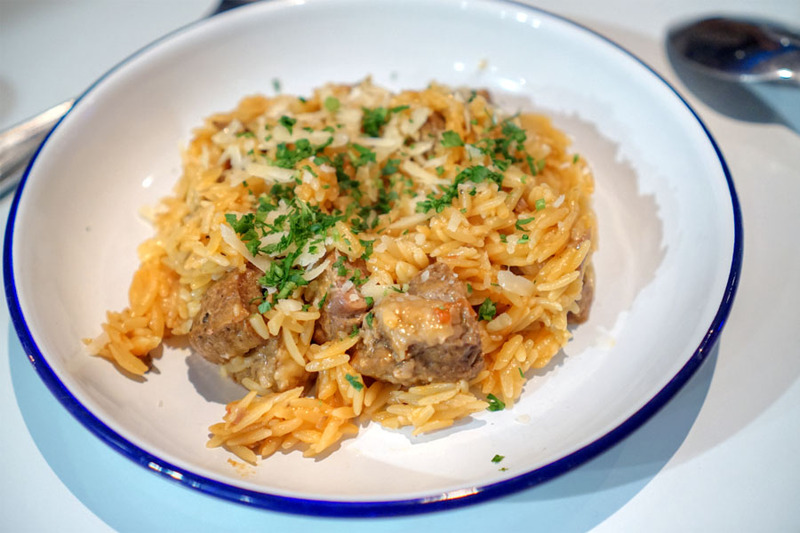 I definitely enjoyed the lamb, the meat coming out super tender, flavorful, and smartly matched to the relative mildness of the kritharáki pasta. Bakaliáros arrived properly briny, and married swimmingly with the citrusy zing of the potato-enriched skordalia. 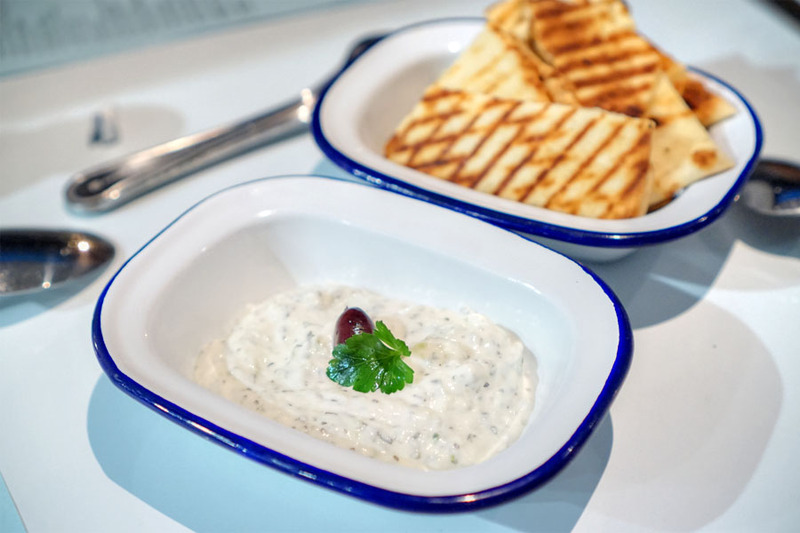 A complementary dish of super bright, creamy, tangy tzatziki was perfect when accompanied by shards of grilled pita. 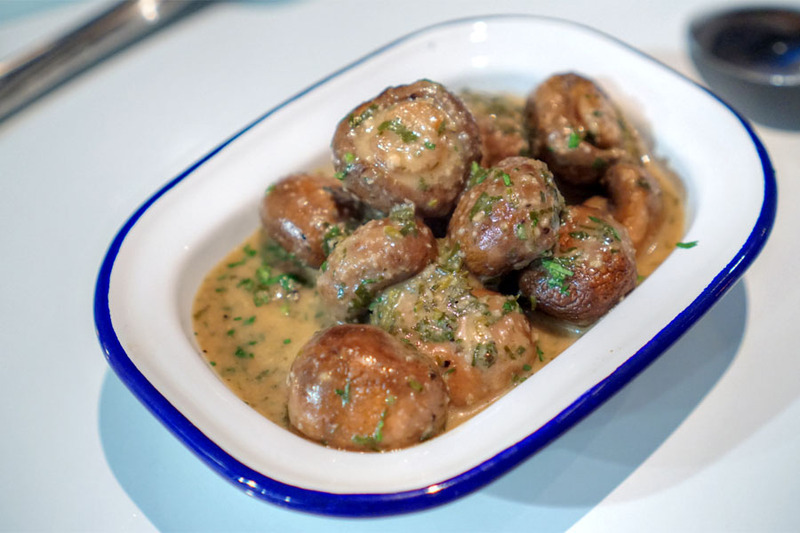 Along with the yogurt came some mushrooms, their rich, earthy taste meshing well with the garlicky notes present. 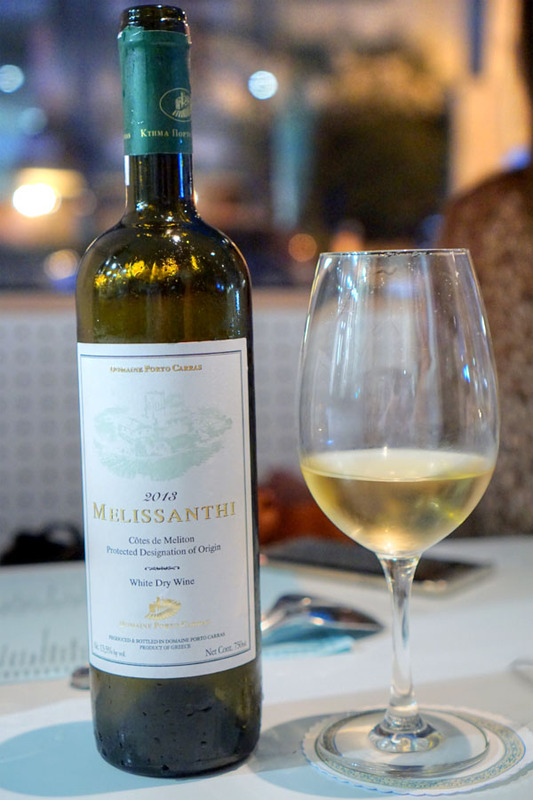 Moving on to a white wine now, we quite enjoyed our bottle of Domaine Porto Carras, Melissanthi, Assyrtiko/Athiri, Halkidiki, 2013, Greece [$40]. Think apple and lemon throughout, with a distinct minerality on the nose and a grassy, herbal quality appearing on the palate. Scallop arrived mildly-flavored and supple, brightened up by cool notes of cucumber while olive lent some more heft. I would've liked more lemon, more chile to really amp things up though. Garídes saganáki brought out some properly snappy shrimp, though the tomato sauce was a bit much, masking some of the natural goodness of the protein. 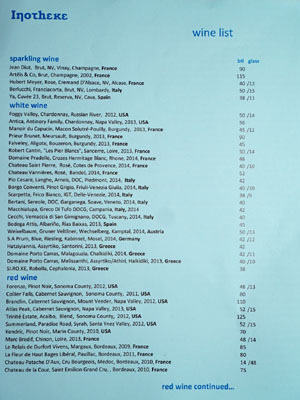 Some more acidity would've been nice to balance things out more. 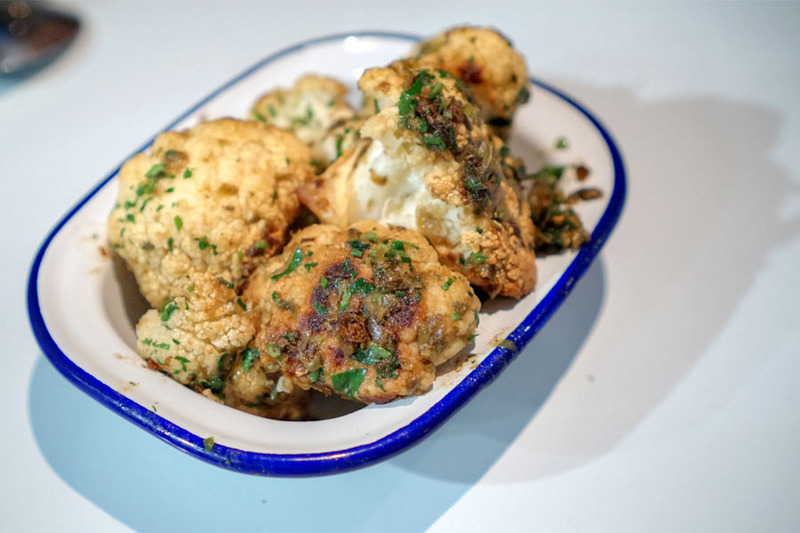 The cauliflower was a highlight, arriving wonderfully charred and loaded with rich, salty, pungent notes of anchovy and caper. 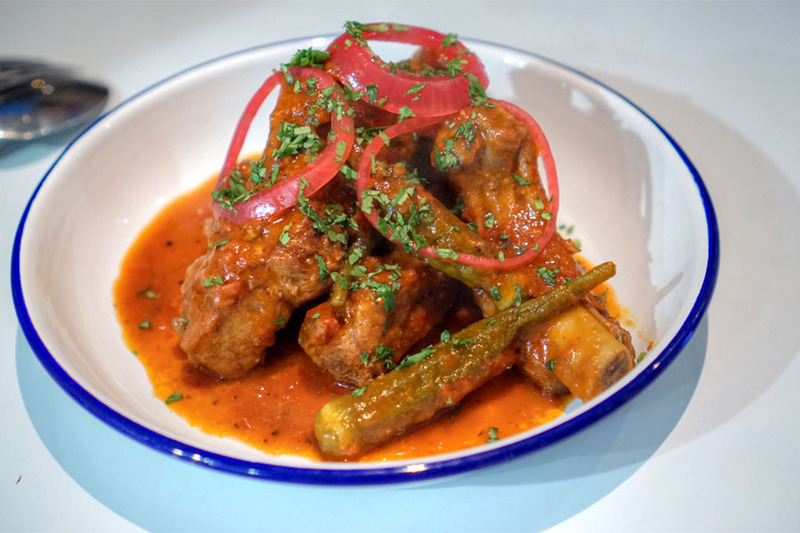 Ribs were tender, but not too tender, and tore cleanly off the bone, their porky flavors making sense with the potency of the sauce while pickled onions provided a touch of acid. 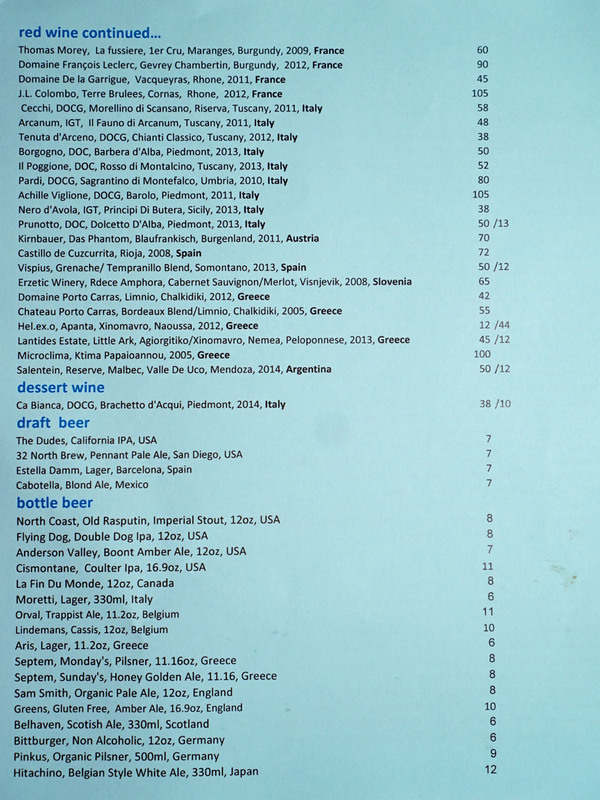 With the wine all drunk up, we decided to sample all three of the Greek beers on the menu, starting with the Aris, Lager, Greece [$6]. 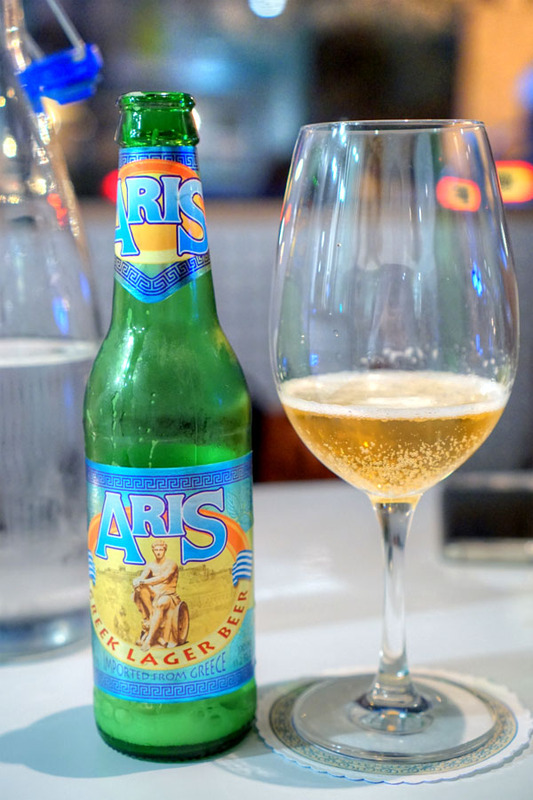 It was pretty much what you'd expect from a European pale lager, a light, fizzy beer with a nose redolent of sweet grain and a palate that was much the same. Easy-drinking for sure. 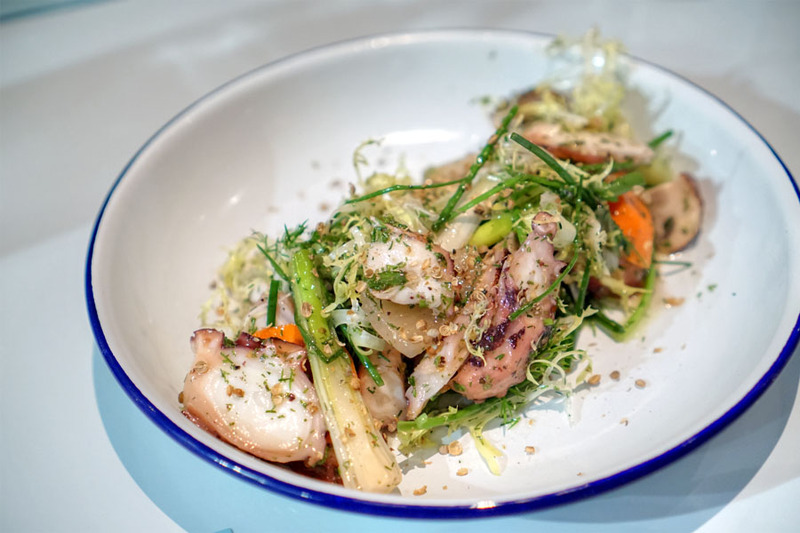 Squid arrived somewhat brinier than usual, though the herbs and tangy vinaigrette made for a semblance of balance. Texturally though, I found the calamari chewier than I'd like. 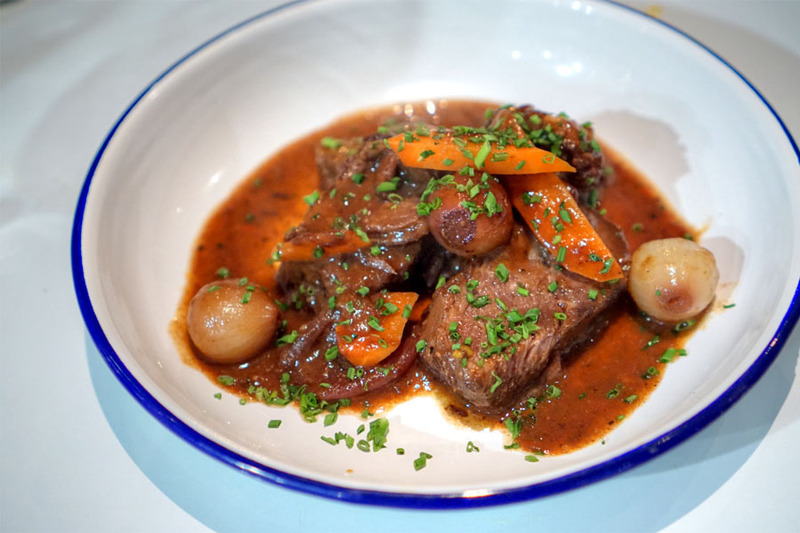 I enjoyed a stew of long-cooked short rib, the meat arriving near-falling-apart tender and teeming with the sort of dark, beefy flavors that develop over time. Nice counterpoint from the shallots and carrots too. A cozy one. 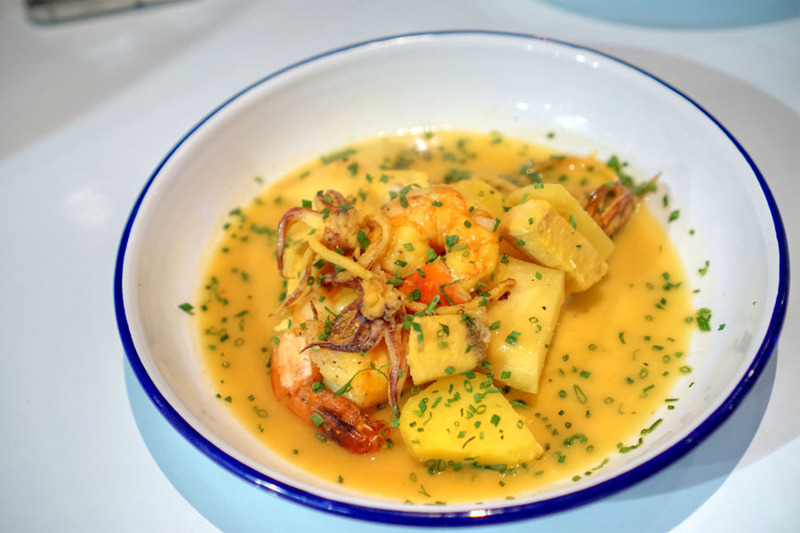 A bouillabaisse-esque seafood soup of sorts conveyed the individual characteristics of the swordfish, squid, and shrimp, augmented by the aromatics of the saffron-laced sauce, though it seemed like the flavors could've used a bit more time to coalesce. Next were two microbrewery-produced beers. 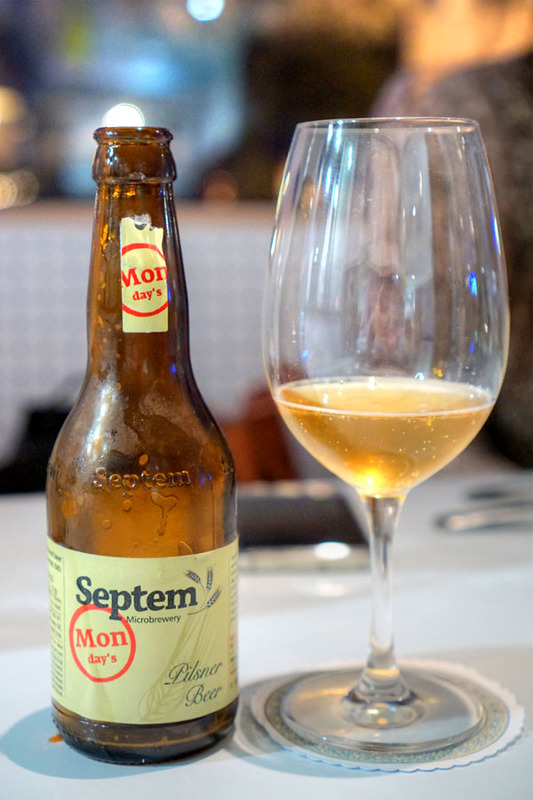 The Septem, Monday's, Pilsner, Greece [$8] displayed a surprising amount of caramel on the nose, while the taste gave up grainy, grassy notes with just a smidge of hoppiness. 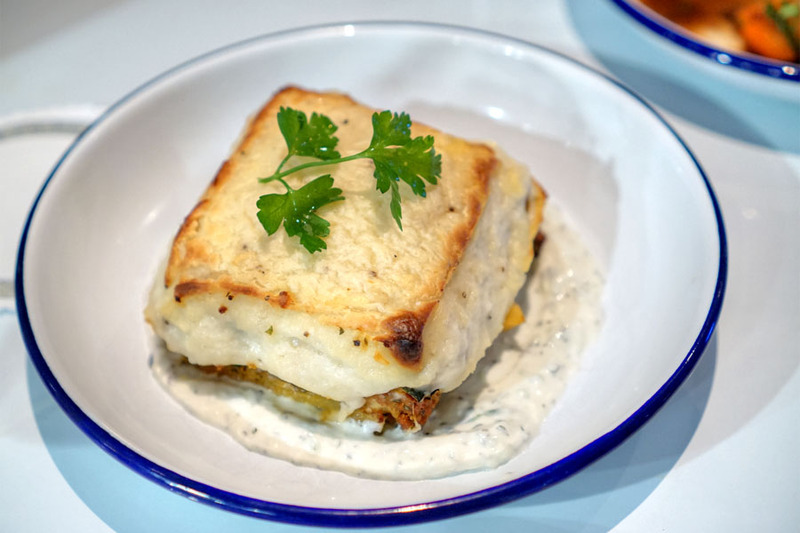 Mousakas [$15.00] | Ground Beef, Eggplant, Zucchini, "Bechamel"
The moussaka was a surprise hit for me, with its base of hearty, spiced beef joined by smoky eggplant and the creamy richness of béchamel. 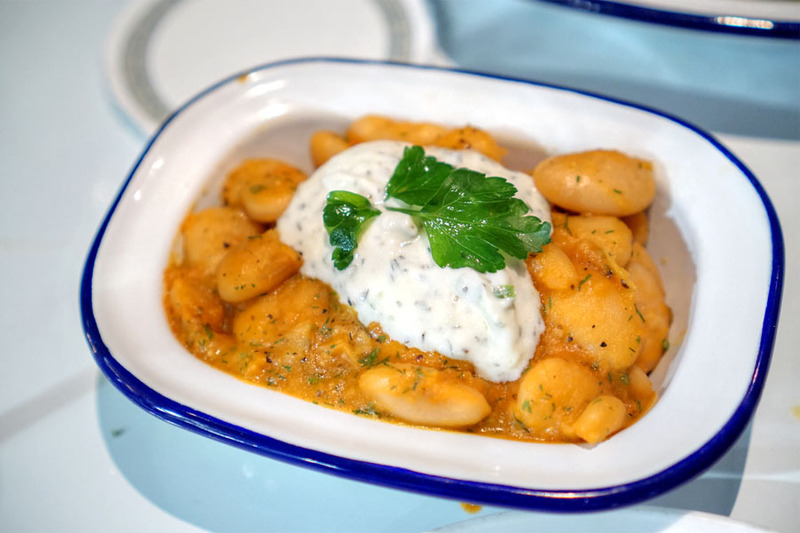 Gigandes plaki brought out some hefty beans set in a tangy sauce, the tzatziki imparting a necessary lightness. The tyropitakia was one of my favorites. 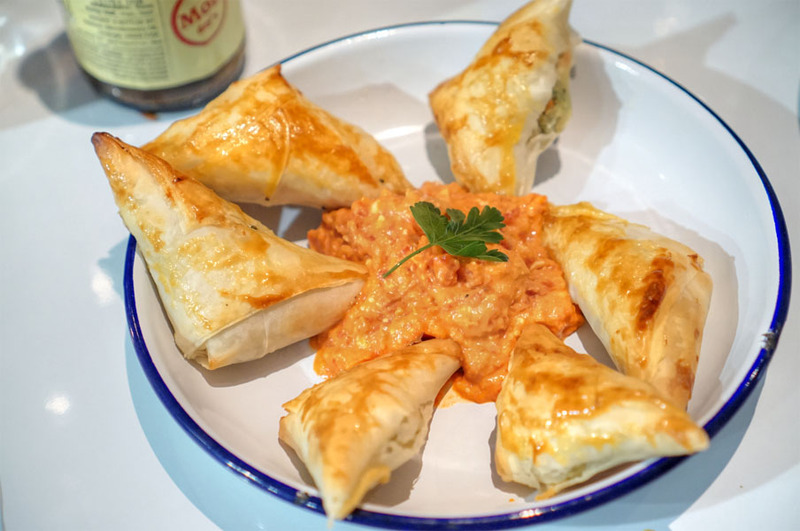 Great crispness on the phyllo, and the cheesy, herby filling worked wonderfully with the peppery tirokafteri provided. 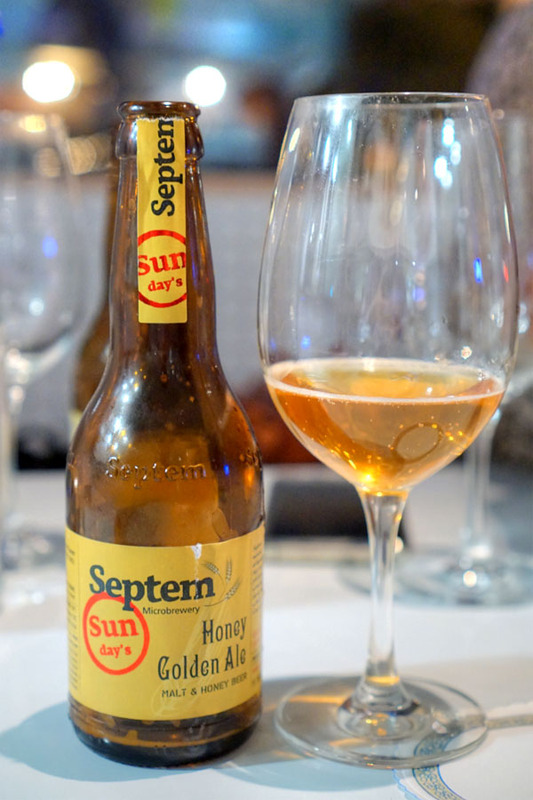 Last to drink was the Septem, Sunday's, Honey Golden Ale, Greece [$8]. Bouquet of honeyed malt commingled with a marked bitterness. Taste brought more hoppiness over a backbone of caramel and honey sweetness. The mavromatika managed to be a favorite as well, with the peas perfectly matched by the earthy bitterness of kale. 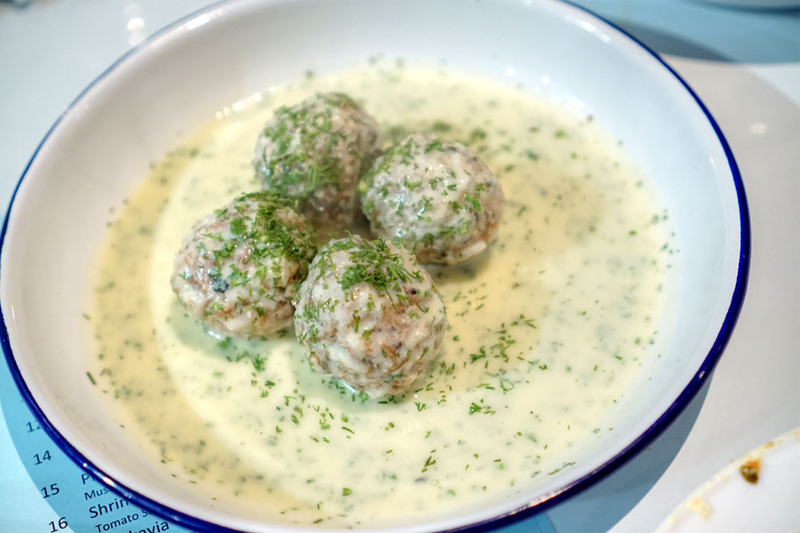 Yuvarlakia were "crumblier" than I'd prefer (likely due to the incorporation of rice), though they worked flavor-wise, their porkiness offset by the light, lemon-y avgolemono sauce. 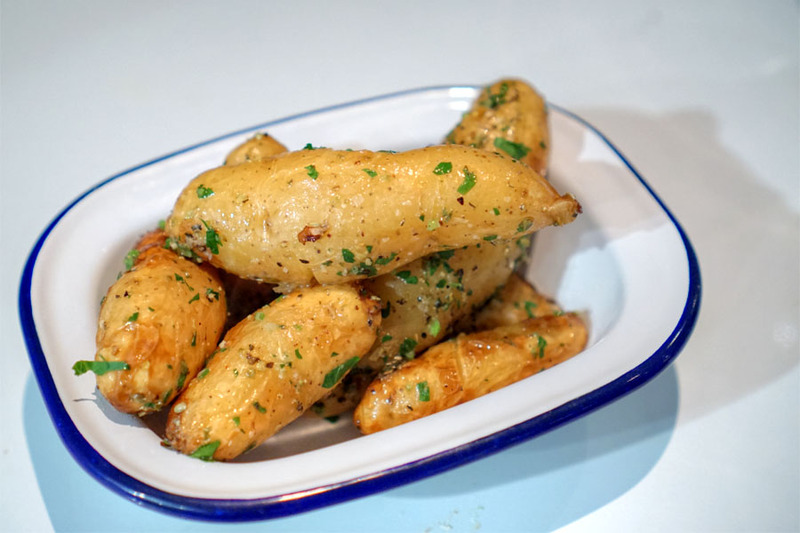 In our final savory, potatoes arrived hearty and hefty, their relatively mild taste augmented by garlic and lemon. 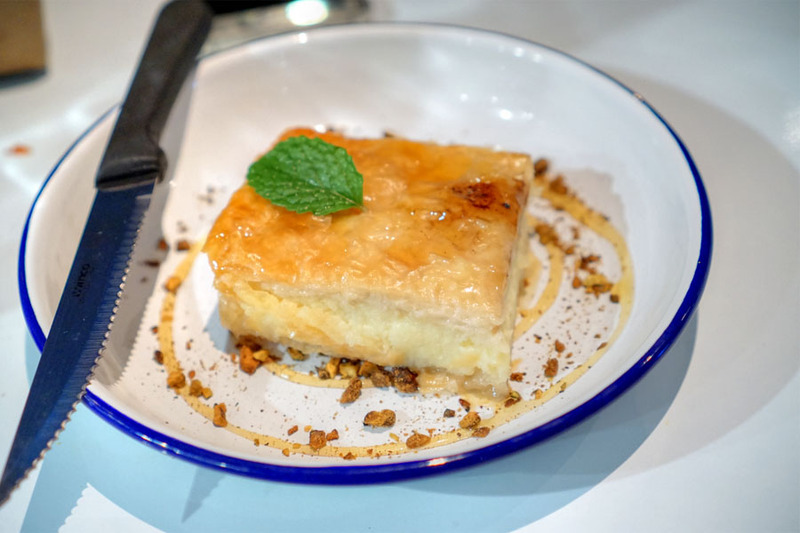 A dessert comprising custard layered in phyllo dough, the galaktoboureko exuded sweet, lactic notes, but also had an indiscernible quality to it that I couldn't put my finger on (one of my dining companions recalled Play-Doh?). 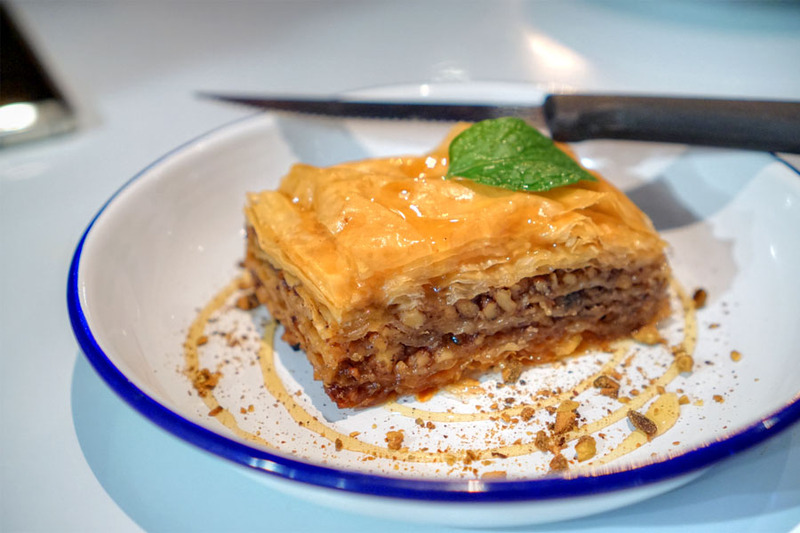 The baklava also featured filo, this time filled with the sweet, dark, nutty flavors that you'd expect. LA doesn't seem to have a very strong Greek restaurant presence, so I was definitely looking forward to giving Inotheke a whirl. 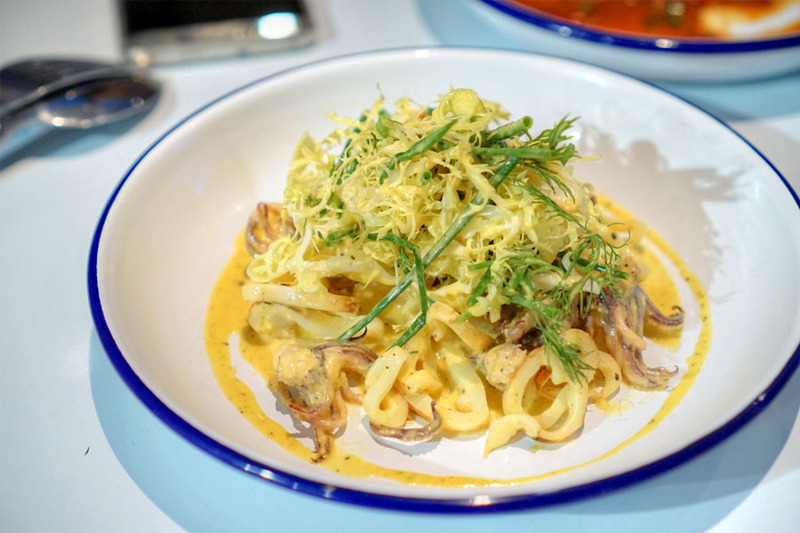 Save for a few exceptions, the food met the mark, showcasing classic flavors with a bit more panache than you might typically find around these parts. A nice addition to SaMo and the Southland. the food here is a bit too salty for my liking.